Sado is maybe larger than it seems on a map, and there is not a railway service, so it might take an unexpectedly long time to get to your destination after arriving at a port. Here are some practical ways to get around Sado, as well as the contact information of various transport providers. Explore the best way to travel for you. Roads on Sado are narrow compared to the mainland and have many tunnels. Coastal areas have few petrol stations. If you drive your own car or a rental car, make sure to fill up with fuel well in advance. 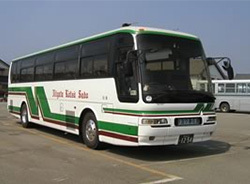 Sado has an extensive bus network which plays a vital role for islanders. Buses offer many opportunities to look around Sado at a relaxed pace, and help you get to hidden places along the way, which are not always found in travel guides. In some places, you can get on and off the bus where-ever you like. This is not possible on the Honsen Line, however, or on some of the other lines. Sometimes bus services are reduced, and you might need to make some transfers, depending on your destination. Please make sure to check timetables in advance. 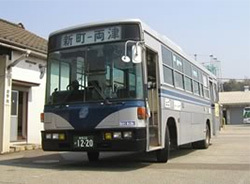 Tour bus services operate from Ryostu Port or Ogi Port to accommodate passengers arriving by Sado Kisen's ships. Bus tours themed or planned to include only strictly-selected highlights, are an efficient way to visit the most popular tourist sites. 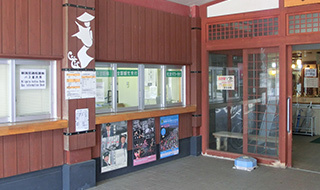 These tours come highly recommended, especially to first-time visitors to Sado. Three different lengths of tours are available to suit your needs and preferences; from half-day tours departing in the morning or the afternoon, to one-day excursions on which you can explore plenty of attractions. All bus tours require advance booking. Taxis are a perfect way to explore Sado in a small group—no need to transfer, no worries about parking and traffic. In addition to basic courses, customised courses can be arranged to suit your preferences.～Consult with an officially licensed, friendly, hospitable driver, who also doubles as a guide, to show you around Sado. Hiring a rental car allows you to choose the car type suited to the number of people in your group, and provides the freedom to explore Sado at your own pace. Driving a rental car is one of the best ways to enjoy scenic driving routes in Sado,～and is a convenient way to travel with family. Book early, or the selection will be limited, especially during the high season when～demand soars. Travelling around Sado by motorbike offers you an exhilarating travel experience, different from cars. In good weather, feel the wind of Sado while riding a bike! Discover the hidden parts of Sado, which cannot be found on trips by car or bus. Travelling by bike is a convenient way to visit places within a short distance. Electric bikes, which make it easier to navigate slopes, are also available. A road trip is one of the most popular ways for families to get around Sado. You can decide on your own route and take as much time as you like, without worrying about your suitcases! 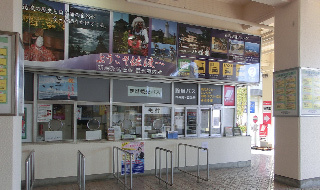 If you are planning to travel with your vehicle from the mainland, please visit Sado Kisen’s website for details.